The Penguins and Lightning meet in game seven of the Eastern Conference Finals Thursday night in Pittsburgh. The Tampa Bay Lightning and Pittsburgh Penguins have battled through six hard fought games. Now it all comes down to a game seven duel Thursday night in Pittsburgh. The winner will advance to the Stanley Cup Final against the Western Conference Champion San Jose Sharks. Tampa Bay looks to return to the Stanley Cup Final after losing to the Chicago Blackhawks last season. Pittsburgh hasn’t been since winning the Cup in 2009. Tampa Bay won game one 3-1 in Pittsburgh, despite losing goalie Ben Bishop to a knee injury in game one. Bishop hasn’t played since and has been replaced by Andrei Vasilevskiy. Bishop is out for game seven. Pittsburgh won game two at home 3-2 in overtime and game three 4-2 in Tampa Bay. The Lightning evened the series with a 4-3 victory in game four. The Lightning won game five in Pittsburgh 4-3 in overtime. The Penguins forced a game seven with a 5-2 victory in game six Tuesday night in Tampa Bay. After benching rookie goalie Matt Murray in game five in favor of veteran Marc-Andre Fleury, the Penguins put Murray back into the net in game six. Phil Kessel scored a 5-on 3 power play goal with just over a minute left in the first to give the Penguins a 1-0 lead. Pittsburgh added second period goals from Kris Letang and Sidney Crosby to take a 3-0 lead into the third. Brian Boyle scored twice for the Lightning to pull them within 3-2 with just over seven minutes left. Bryan Rust added a goal for the Penguins with just over two minutes left and Nick Bonino iced the game with an empty netter to make it 5-2. Pittsburgh had 34 shots to 30 for Tampa Bay, but were outshot 19-8 in the third. Tampa Bay won 39 faceoffs to 31 for Pittsburgh. The Penguins were 1/3 on the power play and the Lightning were 0/1. Murray made 28/30 saves for the Penguins. Vasilevskiy made 29/33 saves. Tampa Bay is coached by Jon Cooper. The Lightning finished second in the Atlantic Division with 97 points behind the Panthers who had 103 points. The defending Eastern Conference champion dispatched the Detroit Red Wings in five games in the first round. The Lightning lost game one against the New York Islanders but then won four straight games to return to the Eastern Conference Finals. Tampa Bay is 58-34-2-3 and the total is 41-44-14 this season. Pittsburgh is coached by Mike Sullivan. The Penguins finished second in the Metropolitan Division with 104 points. Pittsburgh dominated the New York Rangers in 5 games in the first round. The Penguins outscored the Rangers 21-10 in the series. Pittsburgh upset the Washington Capitals in six games in the second round. Five of the six games were decided by one goal including 3 overtime games. Pittsburgh is 59-32-4-4 this season and the total is 45-36-18 this season. Our NHL odds page allows you to see the latest line moves instantly. Tampa Bay is outscoring teams 2.94-2.38 this season. The Lightning average 28.5 shots per game and opponents average 32.9 per game. Tampa Bay is 9/54 (16.7%) on the power play and 53/62 (85.5%) on the penalty kill. The Lightning have not scored or allowed a short handed goal. Bishop is 8-2 in the playoffs with a 1.85 GAA. He has made 279/297 (.939) saves with two shutouts. Andrei Vasilevskiy is 3-3 and has a GAA of 2.88. He has made 210/228 saves (.921). Nikita Kucherov has 19 points with 11 goals. Tyler Johnson has 17 points with 10 assists. Victor Hedman has 13 points with 9 assists. Alex Killorn has 13 points with 5 goals. Jonathan Drouin has 13 points with nine assists. Ondrej Palat has 10 points with 6 assists. Three other players have at least 6 points. Center Steven Stamkos is out indefinitely with an arm injury. Defenseman Mattias Ohlund is out indefinitely with a knee injury. 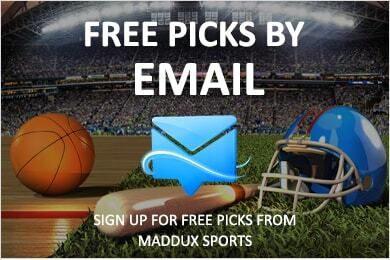 Some of the best online sportsbooks offer sign up bonuses to Maddux clients. Pittsburgh is outscoring teams 3.49-2.47 in the playoffs. The Penguins average 34.8 shots per game and opponents average 30.4 per game. Pittsburgh is 15/59 (25.4%) on the power play in the playoffs and 45/54 (83.3%) on the penalty kill. The Penguins have one short handed goal and has allowed one as well. Pittsburgh goalie Marc-Andre Fleury missed the first two rounds with a concussion. Murray is 10-4 in the playoffs with a 2.30 goals against average. He has made 388 of 420 saves (.924) with one shutout. Fleury is 0-1 with a 3.03 GAA. He has made 28/32 saves (.875). Jeff Zatkoff is 1-1 with a 3.07 GAA. He has made 59/65 saves (.908). Zatkoff played in two games in the first round. Phil Kessel has 18 points with nine assists. Center Sidney Crosby has 15 points in the playoffs including 9 assists. Nick Bonino has 15 points with 12 assists. Carl Hagelin has 12 points with 7 assists. Evgeni Malkin has 13 points with 9 assists. Patric Hornqvist has 11 points with 7 goals in the playoffs. Kris Letang has 10 points with 8 assists. Six other players have at least 5 points in the playoffs. Left wing Scott Wilson and center Kevin Porter are both out indefinitely. Defenseman Trevor Daley is out for the season with a broken ankle. Tampa Bay is 6-0 after a home loss by 3 or more goals, 5-1 in road games, and 9-2 in Thursday games, 12-4 after losing by 3 goals or more, 8-3 after scoring 2 goals or more, 21-8 after allowing 5 goals or more, 5-2 on one day rest, 7-3 against Metropolitan teams, against teams with winning records, overall and against Eastern Conference teams. The road team is 5-2 in this series recently. The over is 21-4-3 in this series recently including 12-3-2 in Pittsburgh. Pittsburgh is 10-2 in Thursday games, 15-4 after allowing 2 goals or less, 25-7 on one day rest, 7-2 against teams with winning road records, 22-7 at home, 6-2 after scoring 5 goals or more, 20-7 against teams with winning records, 21-8 after the opponent scores 2 goals or less, 17-7 after a win, 38-16 overall, 37-17 against Eastern Conference teams, 3-7 in conference final games, and 2-6 when the opponent allows five goals or more. The Penguins have won 8 of the last 11 games at home against the Lightning. Home ice has meant nothing in this series as each team has won twice on the road. These teams are evenly matched and I honestly couldn’t pick a winner. I think it will be high scoring and entertaining and will be a battle. Get our best NHL hockey picks now to crush the books.